Is there a better alternative to cyWriter? Is cyWriter really the best app in Word Processing category? Will cyWriter work good on macOS 10.13.4? cyWriter needs a review. Be the first to review this app and get the discussion started! cyWriter needs a rating. Be the first to rate this app and get the discussion started! 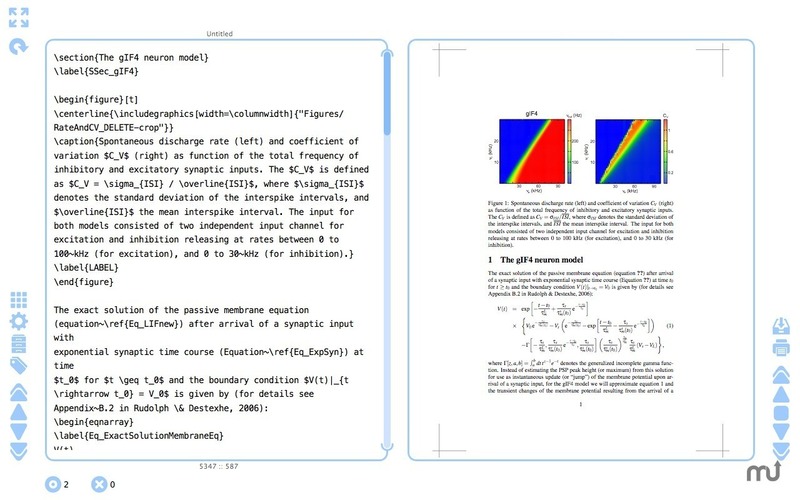 cyWriter is a full-screen enabled distraction-free real-time LATEX writing environment for OSX. cyWriter's clean and minimalistic yet highly configurable interface delivers a simplicity which allows the user to focus on contents while producing professionally formatted publication-ready documents. In contrast to many other word processors, cyWriter employs the LATEX typesetting engine, in which access to a rich set of formatting features is achieved through simple textual commands. This implementation produces high-quality PDF documents that are up to the standards of professionally edited printed books, journals or articles. cyWriter can be used without any prior knowledge of LATEX for producing extensive high-quality text documents. However, with only a small set of simple commands described in cyWriter's Manual, practically unlimited access to the full formatting power can be obtained, which allows to produce documents with professionally formatted tables, equations and figures.